Before Muntinlupa became known as a ‘residential haven’ due to the development of posh Ayala Alabang Village, the city located in south Metro Manila was famous for the New Bilibid Prison. Bilibid, the national penitentiary or also known as Muntinlupa ‘loob’, is home to the country’s most famous – or rather notorious – criminals. 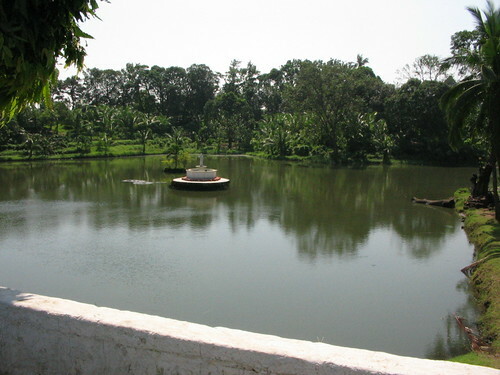 But did you know that Muntinlupa City also boasts of the country’s smallest natural lake and other attractions? Yes, they’re all hidden within the grounds of the prison complex. Last All Saints’ Day, I dragged my sister along for a driving tour of Bilibid. Upon entering the gate of the complex, we were surprised by how peaceful the community was. The place was surprisingly relaxing – you wouldn’t imagine that the country’s most dangerous killers and rapists are just a few meters away. Anyway, we first saw Jamboree Lake, said to be the country’s smallest natural lake. The water was clean and so was the surrounding park. We stopped the car to admire the view. A few feet away from the waterfont is a mound with a big cross on top of it. I later on learned that the mound was called Monument Hill. It is the burial place of Eriberto B Misa, director of prisons during World War II who, according to his gravestone, “made prison life bearable”. A vintage World Wide II canon can also be found on top of Monument Hill. 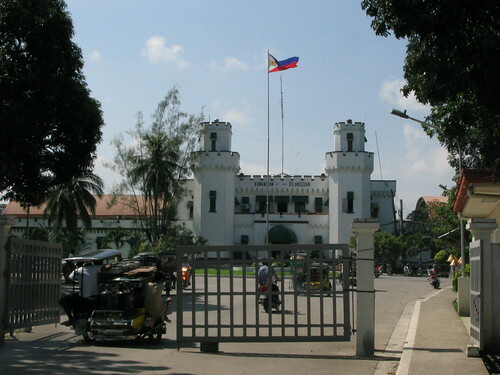 Driving ahead, past the complex’s church, is the National Bilibid Prison administrative building. The maximum security facility is said to be within those walls. Unfortunately, my sister and I didn’t know where to head off next, or whether we could even enter the gates in the photo above. I later on learned that a Japanese cemetery could also be found inside the prison complex. This is the cemetery where General Yamashita (of the hidden treasure fame) is buried. So if you’re around the Muntinlupa area, try visiting Muntinlupa ‘loob’. Not only is the place rich in history, but it is safe as well. I thought Yamashita was reburied in Japan. I think he meant Yamashita’s treasure. Anyway, this is interesting, I’ve never been anywhere near “Munti”. Thanks for this! Interesting! I should check this out next time I visit some friends in Alabang. yes general yamashita is buried in nbp. im a muntinlupenyo.!! and muntinlupa is really nice..